Conservatives often describe regulations as “red tape” or as “job-killing” impediments on the economy. But that rhetoric is intended to obscure the truth that regulations set the economic rules of the road. Regulations ensure that workers get paid for the hours they work; that their retirement is secure; and that the costs of the goods they rely upon are affordable. Under the Trump administration, however, those rules are being rewritten in ways that are making it harder for many Americans to get ahead. President Trump’s attacks on regulations that ensure workers are paid overtime; protect retirees from unscrupulous financial advisers; and ensure that people pay less at the pump could cost Americans up to almost $42 billion per year. (see Table 1) Far from cutting red tape, Trump and his administration are rigging the system against everyday Americans. Under the Fair Labor Standards Act, many Americans have the right to time-and-a-half pay for hours worked beyond the 40-hour week. Although this rule covers the majority of hourly and salaried workers, white-collar workers whose jobs are classified as “executive, administrative, or professional” can be denied overtime if they make more than the $23,660 salary threshold. When the salary threshold was first enacted in 1975, it protected 62 percent of full-time salaried workers. In recent years, however, the threshold has not been updated, bringing that number down closer to just 7 percent. Seeking to restore these protections, the Obama administration’s Department of Labor (DOL) announced in 2016 that it would raise the salary threshold to $47,476, with automatic updates scheduled every three years to account for inflation. Under this rule, 4.2 million workers would have automatically become entitled to overtime pay. Additionally, the higher salary threshold would have made it harder to misclassify midlevel workers as “executives” or “professionals” with overtime exemptions. All told, 12.5 million workers would have had new or increased protections under the rule, which would have raised incomes for the middle class, encouraged work-life balance, and increased worker productivity. Unfortunately, Trump blocked the overtime rule from becoming reality. Shortly before the rule was scheduled to take effect in December 2016, a federal judge put it on hold and then struck it down entirely based on a poor reading of the law. Rather than defend the rule, the Trump administration abandoned it altogether. And in October 2017, the administration signaled through the courts that it would undertake further rule-making to revise the threshold. The department has now proposed a new rule that would set the salary threshold at around $35,000—significantly lower than the threshold in the rule that it abandoned, which would have increased the overtime threshold to $55,068 by 2022. The proposed rule would cover 2.8 million fewer workers in its first year than the 2016 protections, a gap that would grow to 4.3 million workers in 10 years, according to the DOL’s own estimations. Trump’s abandonment of the Obama-era overtime regulations has already resulted in an estimated nearly $1.7 billion in lost wages. In 2016, the Obama administration’s DOL passed protections—known collectively as the fiduciary rule—that required financial advisers who sell retirement products to act in the best interests of their clients. Previously, a loophole in the Employee Retirement Income Security Act had allowed advisers to recommend options that generally suited a client’s financial situation and needs—even if they were not the best available option. Given this loophole, compensation structures for brokers created a conflict of interest, as they were incentivized to steer people toward products that were more lucrative for their employer but more costly for their clients. An investigation by Sen. Elizabeth Warren’s (D-MA) office, for example, discovered that many companies offer kickbacks, such as all-expenses-paid vacations, to advisers who recommend more costly financial products. As a result, retirement savers can end up paying higher fees or get locked into plans with lower performance. The Trump administration has undermined the Obama administration’s critical protections. 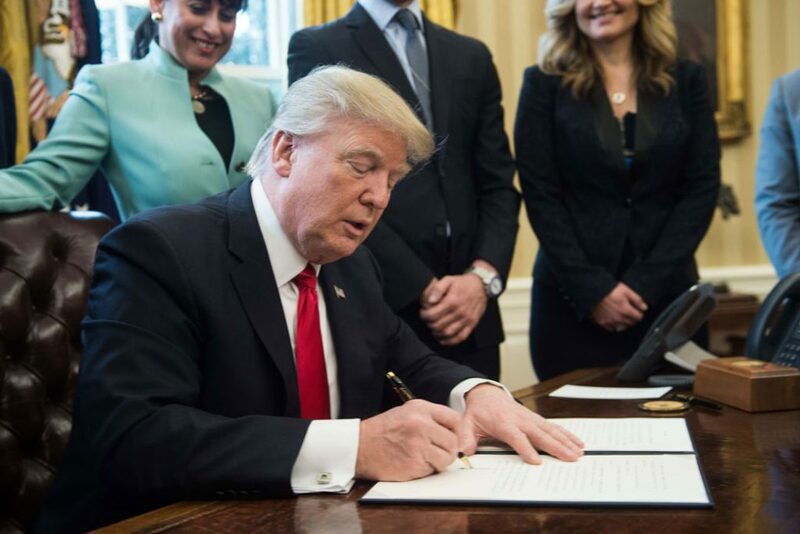 Shortly after taking office, Trump’s DOL delayed implementation of the rule for 60 days while it re-examined the rule’s effect—despite the fact that the department had spent six years developing the rule. Then, when a federal appeals court vacated the rule, the Trump administration did not appeal the decision, letting it die. In April 2018, the U.S. Securities and Exchange Commission (SEC) proposed a new rule that claims to protect savers’ best interests by outlining standards of conduct. However, the proposal does not clearly define “best interest,” suggesting that in practice, advisers would not actually be required to recommend the best possible option to their clients. It also fails to provide guidance on how brokers should go about mitigating certain types of conflicts of interest. It does nothing to rein in the many perverse incentives that brokerage firms artificially create to encourage and reward recommendations that are very profitable to firms but harmful to investors, which is concerning because receiving conflicting financial advice is expensive. According to the DOL, “[A] typical worker who receives conflicted advice when rolling over a 401(k) balance to an [individual retirement account] at age 45 will lose an estimated 17 percent from her account by age 65.” Nationwide, retirement savers lose an estimated $17 billion per year due to conflicting financial advice. The Corporate Average Fuel Economy standards and the Clean Air Act both regulate fuel efficiency and control pollution for vehicles produced for sale in the United States by setting a minimum distance that vehicles must travel on a gallon of fuel and setting emissions limits by vehicle type. According to a study by David L. Greene at the University of Tennessee, Knoxville, improvements in fuel efficiency have saved American consumers a whopping 1.5 trillion gallons of gasoline since 1975. In 2011, the Obama administration reached a historic deal with major automobile manufacturers to significantly raise fuel economy requirements for cars and light trucks from 2017 to 2025—thus ensuring more efficient vehicles and ultimately decreasing air and climate pollution nationwide. The plan, referred to as the clean car standards, mandated that, among other things, U.S. vehicle fleets average 54.5 miles per gallon by 2025 through annual incremental efficiency changes. The Obama administration estimated that the new standards would lower oil consumption by 2.2 million barrels per day by 2025—saving consumers $1.7 trillion in fuel costs over the life of the program. Those landmark clean car standards have been under attack throughout the Trump administration. The Environmental Protection Agency and the U.S. Department of Transportation’s National Highway Traffic Safety Administration announced a proposal in August 2018 to replace the Obama-era climate pollution and fuel economy standards. The proposed Safer Affordable Fuel-Efficient Vehicles rule would freeze model-year 2016 fuel economy requirements through 2020. Rolling back the existing standards would lead to increased greenhouse gas and particulate matter emissions, regulatory uncertainty for automakers, and higher costs for consumers. An analysis of the cost effects on each of the 50 states indicates that Trump’s move would cost people a net $23.8 billion per year, primarily from higher spending on fuel. These three regulatory rollbacks will cost Americans at the workplace, in their retirement accounts, and at the pump—totaling up to roughly $42 billion each year. The federal government has significant power to set the rules of the road that help determine who the economy benefits and who it does not. Unfortunately, the Trump administration has used this power to further rig the system against everyday Americans—making it that much harder for them to get ahead. Sam Berger is the vice president for Democracy and Government Reform at the Center for American Progress. Malkie Wall is a research assistant for Economic Policy at the Center. *Authors’ note: Lost wages were calculated using the difference between estimated average annualized transfers over the first 10 years for the final 2016 rule (see Table ES1: “Summary of Regulatory Costs and Transfers, Standard and HCE Salary Levels”), adjusted for inflation using CBO’s January 2019 Baseline Economic Forecast, and estimated annualized transfers over the first 10 years for the proposed March 2019 rule. (see Table 2: “Summary of Regulatory Costs and Transfers, Standard and HCE Salary Levels”). State-level estimations are based on state proportions in the Center for American Progress’ “Tracking the Cost of Trump’s Overtime Pay Cut” calculator. **Authors’ note: The state-level breakdowns for the net cost of weakened fuel efficiency standards are based on M.J. Bradley and Associates’ analysis of the net cost for American families of freezing fuel economy targets at model-year 2020. This analysis used the U.S. Energy Information Administration’s Annual Energy Outlook 2018 reference-case oil price forecast, as well as American Community Survey (ACS) five-year estimates on the number of occupied housing units per state in 2016. The analysis did not include data on Washington, D.C. The authors’ nationwide average uses M.J. Bradley and Associates’ estimated net savings for the average U.S. family at reference-case oil price, along with ACS five-year estimates on the total number of occupied housing units in the United States in 2016. Note that state-level estimated savings will not sum to national estimated savings unless state-level vehicle miles traveled and fuel prices are perfectly uncorrelated.